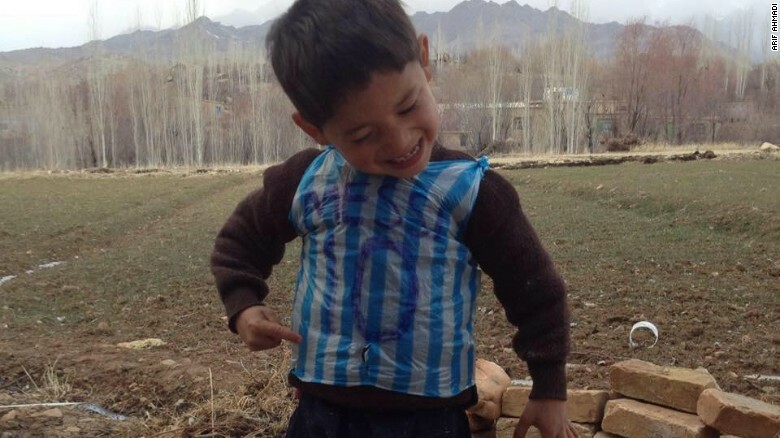 Welcome to Mercy Ebute's Blog: Photos: 5 years old poor Afgahanistan boy get world's attention for wearing a leather made jersey with Messi's name and number on it. Photos: 5 years old poor Afgahanistan boy get world's attention for wearing a leather made jersey with Messi's name and number on it. A 5 year old football and Messi lover emerged online wearing a striped plastic bag with the football player's name and number scrawled in blue ink. A search for the boy immediately started and according to report on CNN, the boy have been found. He's five-year-old Murtaza Ahmadi from Afghanistan who "loves football and Messi." "When he suddenly wakes up in the middle of the night, he starts crying that he wants to go to Messi," his father, Arif Ahmadi, told CNN from the family's farm in Jaghori, south-west of Kabul. Murtaza then started asking his father for a Messi jersey, Ahmadi said. "I told him that we were living in a poor village far from the city and it was impossible for me to get him the shirt." "He kept crying for days asking for the shirt until his brother Hamayon helped him make one from the plastic bag to make him happy. "He stopped crying after wearing that plastic bag shirt," Ahmadi said. Images posted to Hamayon's Facebook page show a smiling Murtaza wearing the shirt and appearing to dance. An image posted to Hamayon's Facebook page shows his little brother dancing in his makeshift shirt. Internet users started searching for the mystery boy in mid-January when a Leo Messi fan account on Twitter posted an image of him wearing a plastic "Messi" bag. The Iraq reference turned out to be false. A Twitter user who tweeted that the boy was from Dohuk -- a city in northern Iraq -- later admitted that he'd made it up. But the false lead led to claims by a Kurdistan television station that they'd found the boy in Dohuk. In fact, Murtaza lives with his family in a rural village in Afghanistan, where he's become something of a celebrity. Images posted to Facebook on Wednesday show the small boy still wearing his vest and posing with his proud father and other villagers. 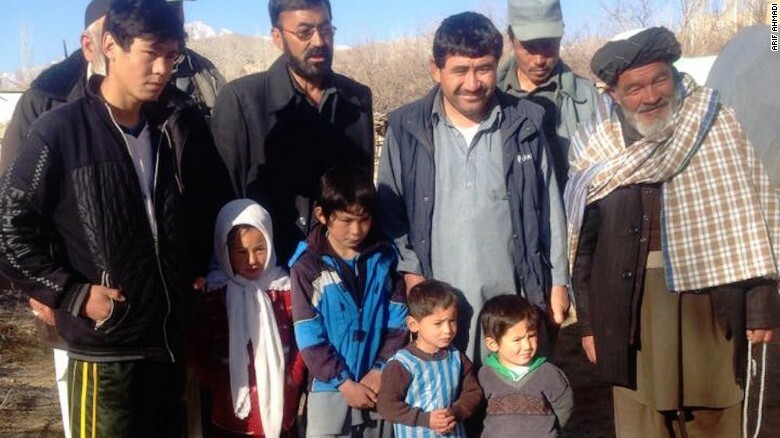 Murtaza poses with local villagers, including his proud father Arif, in the blue vest, third from right. "I feel very happy that he is famous now," Ahmadi said. "He is really excited that his pictures are everywhere now. He wants to become a football player in the future and go to school." And "he wants to meet Messi," he added. Murtaza's life couldn't be more removed from that of his idol. Earlier this month, Messi reclaimed his title as the world's best player, winning his fifth Ballon d'Or award at a lavish ceremony in Zurich. "It's much more than anything I've dreamed of as a kid," Messi said, as he accepted the award. "I want to thank everyone who voted for me and I want to thank my teammates. "And lastly, I want to thank football in general for everything it has brought me. Both the bad and the good. Because it has made me learn and grow." Last week, the Leo Messi fan account tweeted that they'd received a direct message from Leo's team. "They want to know who this kid is so that Leo can arrange something for him."